We have tied-up with certified vendors who assure us about the quality of the material that we used for product manufacturing. Thus, the finished products comply with high-quality standards. Rely on us for timely delivery as we are assisted with up-to-date transit facilities and logistics services. 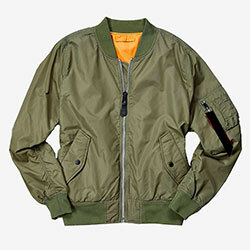 WB-2008 Bomber Jacket is highly soft and comfortable and is available in different designs and sizes. Material: We use top quality Melton wool & high quality cowhide leather and purchase our fabric from only the highest acclaimed manufacturers and suppliers. Tackle Twill & Embroidered Logos: Tackle twill, Embroidery logos, collar & front body woven labels & tags options are available. Custom Designs: Varsity Jackets are 100% 'made-to-order', so you can create own design and email us the PDF or AI format files. You can add your logos, names and numbers for no extra cost. Sublimation Process: Our digital sublimation printing process is computer-controlled which the fabric remains soft and breathable, and the print will not wash-out, fade, or deteriorate. Seams: our seam work is the next most important component in creating quality sports apparel. An advanced '4 thread-over-lock' machine stitch is used to ensure superior strength and stability. Quality: Our standards of quality are never compromised and our quality products are used by top professionals throughout worldwide. Custom Size: European and American sizes are available for men’s & women’s, kids & Adults also we could make new patterns according to your customized size chart.